Preheat the oven (Gas mark 4, 180°C, 350°F ). Weigh and calculate the cooking time for the beef. Place onto a rack in a roasting tin and open roast for the calculated time. Place the potatoes, onions and garlic cloves in a separate tray and drizzle with the oil. Roast at the same time as the beef, or for slightly less time if cooking a large joint. After 30 minutes, remove the garlic. Squeeze the roasted garlic out of their skins and place in a saucepan. Add the port and cranberry sauce. Heat until the cranberry sauce has melted. Twenty minutes before the end of the cooking time, glaze the joint with a couple of spoonful’s of the glaze. Repeat during the last 10 minutes. When the joint is cooked remove from the roasting tin and add 300ml (½pt) water or stock to the pan, stirring to remove any crispy bits. Pour the stock into the saucepan with the remaining glaze, bring to the boil and add the gravy granules. Heat for 1-2 minutes until the gravy is thickened. 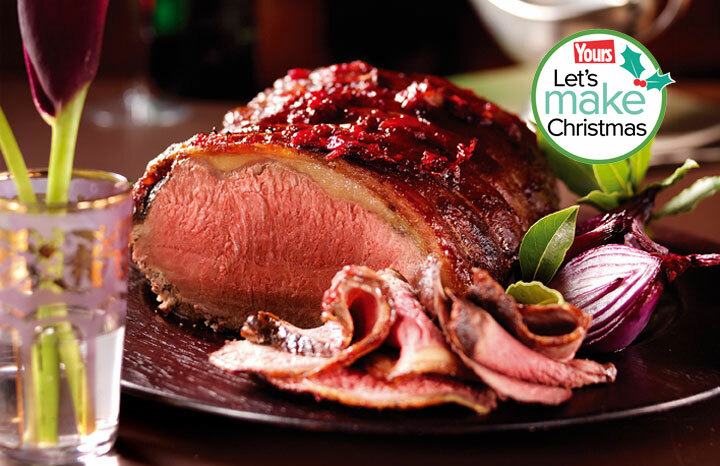 Serve the beef with the roasted potatoes, port and cranberry gravy and seasonal green vegetables. Festive food tips from the experts!